Bah. Alto is a gnat compared to Max. Still, none of this has anything to do with Macross FB7. EDIT: I other words, who do I complain to about taking my post in the 30th Anniversary thread (and "Macross FB7" is only a SMALL part in the 30th anniversary celebration) and turning it into its own thread (making it look like I created it) without asking me first? If Alto showed up, I don't think he'd interact with Basara well. Even though he's been with Sheryl and Ranka for so long, I can't imagine that he'd understand Basara's way of life or desire to sing even if it kills him. So I'm hoping they don't cross paths. Alto definitely didn't like Basara in SRWZ2.2, until Basara's voice together with Ranka's reached him and made him realise that Basara is truly passionate. 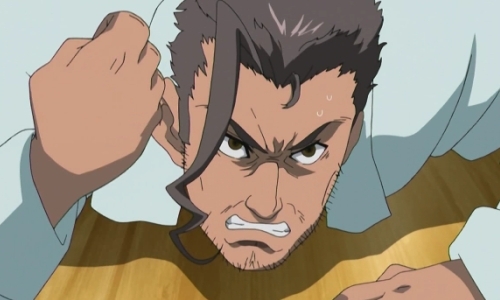 One great thing was that Gamlin tried to convince people to listen to Basara's music and accept him. Gamlin had the most character development in the entire Macross 7. Also for battle mechanics, Basara's songs heal and buff allies but chase Vajra away and remove them from battle because the sound energy interferes with Vajra communication and brainwaves. And Ozma recieves double the effects from all of Basara's songs, allowing him to reach the highest possible stats in the entire game. *sigh* Since I supposedly created this thread, is there any way I can delete it? Contact an administrator. You could ask them to remove your very first post. Delete? No, you can ask a mod to lock this thread or merge it with the other one. "NOTE: This is (according to people I've talked to) NOT a big anime, NOT a feature-length production. In other words, the musical is bigger than this. DON'T expect new animation, DON'T expect new plot." Can't disagree here and Alto is my second favorite male character in Macross. After Max. 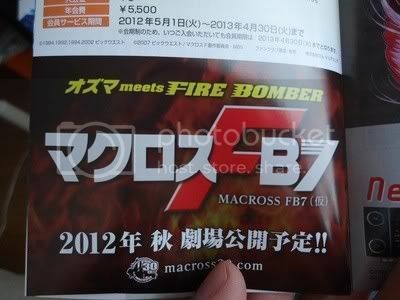 At a live exhibition MACROSS:THE DESIGN@PARCO, a new movie of Macross Frontier and Macross 7 titled “Ozma meets Fire Bomber Macross FB7″ (tentative title) was announced. It will be premièred this autumn. "AT LAST I CAN BE THE main HERO, AND BEAT...ERR..MEET BASARA!!!" How long will it be? One hour? Come on People! Inochi no kagiri! Omaaaae oooooooo! Mamoritsudzukeru my soul for you! I dunno, I'm just so tired of idols in anime lately that I'd be totally 100% down for a Fire Bomber focused Macross Project. They can have Ranka and Sheryl in there too and do a crossover perfomance, but I fail to see the problem with bringing rock back to Macross. Also clearly nobody matches Max in Macross. Max is like a pimp, ace pilot and the best wingman you can ask for all rolled into one and is voiced by Sho Hayami to boot. confirmed for 90 minutes of reused footage. Eh, not quite what it says in the article. "The 90-minute title takes remastered and re-edited footage from the Macross 7 television series and combines it with brand-new Macross Frontier footage to create a completely new form of entertainment." The total running time is 90 minutes, which will include brand new footage from MF. Oh come on. Can't they make an entirely new move using new footage instead of recycling ? Okay; I'm interested. It shows Ranka; so I'm game to see what new footage she will get. A "completely new form of entertainment?" Because we can see Something new!